By Worshipful Kingman P. Cass. Tonight is a happy and inspiring event, the One Hundredth Birthday Celebration of William Parkman Lodge, Ancient Free and Accepted Masons; but the rich heritage bequeathed to us carries a solemn and continuing challenge as we commence another century. May I briefly review some prominent milestones in the history of our Lodge, made possible by that small group of sincere and earnest Masons whom we honor tonight as founders. WILLIAM PARKMAN LODGE, ANCIENT FREE AND ACCEPTED MASONS, had its beginning on a winter's evening in January of 1864, when Brother Abijah Thompson, III, owner of the tannery on what is now Manchester Field, invited Dr. William Ingalls, David Skillings, Josiah Stone and Albion Joy to his home on Walnut Street to discuss the formation of a Lodge in Winchester by several who were already members of the Craft. They were joined at their next meeting by Brothers Oliver Wellington, Cephas Church, Matthew Oliver and Samuel Bartlett, all Master Masons, and by Edward Boon, Albert Lane and Henry Whitten, initiated elsewhere, but wishing to complete their degrees in the proposed new Lodge. This was in February, and with great enthusiasm and prior approval of Most Worshipful William Parkman, Esquire, presiding Grand Master at the time, the Committee voted to procure rooms and negotiate a lease for five years in the Lyceum Building on Mount Vernon Street across from our present Apartments. The available second floor assembly-room was small, but whenever inadequate for large meetings, Lyceum Hall could be used on the third floor. In due course a petition was drawn up and submitted to the Most Worshipful Grand Master, bearing approval of the District Deputy; and under date of May 9, 1864, a Dispensation was issued over the signature of Most Worshipful William Parkman as Grand Master. Albion K. P. Joy was appointed First Master, and Josiah Stone and Abijah Thompson, III, became the First Wardens. The Lodge held its first formal meeting with a complete line of officers in Lyceum Hall on May 10, 1864. Many donations of furniture and funds were gratefully received, and one treasured gift which was promptly installed was a Masonic and symbolic chandelier for lighting the center of the new Lodge assembly-room, a token of the friendship and good wishes of Mt. Horeb Lodge in Woburn, which has been previously founded in 1855. As most of you know, the Town of Winchester for many years before its Incorporation in 1850 was known as South Woburn. Our Brother Frederick O. Prince was Chairman of the Town Committee which finally chose the new corporate name of Winchester. An examination of our Petition, Dispensation and Charter records brings to light many well-known Winchester names, founders of our Town in business, political, social and religious life. These names have been perpetuated by Town landmarks, such as Skillings Road (our First Chaplain), Thompson Street (our First Junior Warden), and Prince Avenue (Brother Prince was a Charter Member who later moved to Boston and became Mayor of that City.) The former Wadleigh School was named for our first elected Secretary, Brother Edwin A. Wadleigh; Samuel Symmes, Charter Member, was of the Symmes family of Symmes Corner, whose name was given to the adjoining Symmes Road. Records of the Secretary during Dispensation refer to the newly formed Lodge as "Parkman Lodge", but the Most Worshipful Grand Master seemed in accord with the eventual idea of giving it his full name, as requested by the petitioners. In fact, he took time to come out to Winchester and witness a Master Mason Degree on October 10, 1864, just before the busy ceremonies of laying the corner-stone for the new Grand Lodge Temple. We are very grateful to Brother Donald Houston Rice of Seal Beach, California, third generation of William Parkman members in the Houston-Rice family, for his gift of a diploma in hand-carved frame, issued to his grandfather James Houston dated February 12, 1865, and bearing the signatures of Most Worshipful William Parkman and our first three appointed Officers. History relates that Brother Houston pastured the family cow daily on Winchester Common, but we fear that such practice if pursued today would land Brother Houston in Woburn Court, and not even our Junior Steward (of the Board of Health) could save him. If you have not already seen Brother Houston's framed diploma of 1865, you will find it on the left wall as you leave the Lodge Room across the entrance from the Tyler's desk. Also there are two photostats of the Winchester Star describing our 50th Anniversary. We have the original copy, bearing the imprint of Judge Littlefield, a former Secretary, but the newsprint paper has become so fragile that we have had these photostats made through the courtesy of Winchester Town Library and Microfilm at Waltham. The records of Brother William F. Fitch, pro tern Secretary in the years 1880-81 are in the maroon leather binding on the long lounge table, and were hand-written in scroll and illuminated by him. The illuminated headings are symbolic, and beautifully done, thanks to Brother Fitch's artistic talent. One other memento is of special note, namely, the two photograph albums of our founders and early members. Finally, on June 14, 1865 our Charter was granted by the Most Worshipful Grand Lodge, and the Constitution, Dedication, and Installation of Officers took place in Lyceum Hall on June 22, 1865. Most Worshipful William Parkman, his Officers and Distinguished Guests came out from Boston by special train, and with visiting Masons from Woburn, Medford and other nearby communities, over three hundred Masons were assembled. Brother Wadleigh, our Secretary, wrote that "the halls and stairways were decorated with evergreen, and choice bouquets of flowers shed their sweet fragrance in great abundance". After the ceremonies, the record states that all repaired to the Banquet rooms, where sumptuous and adequate "provision was made for their inner wants". The Most Worshipful presented the hand-wrought silver Officers' jewels which are in use to this day. In 1880 it was felt that the Lodge had outgrown its facilities in the Lyceum Building, and plans were made to move across the street to our present location at 1 Mt. Vernon Street. This building was then known as the Brown and Stanton Block, and a series of entertainments and donations large and small enabled the moving plans to materialize. So on January 14, 1881 another special train was chartered from Boston. This seems to have been the elegant mode of travel in those days. Our staunch friend, Most Worshipful William Parkman, headed a party of Masons, stopping at Medford for the presiding Grand Master, Most Worshipful Samuel Crocker Lawrence, who officiated at the dedication of our present Lodge rooms. All enjoyed a wonderful time, and (difficult to believe in these waning days of the Boston and Maine), the Boston and Lowell Railroad donated the train ride and gave us a receipted bill, and this is so recorded by our Secretary. No particular note seems to have been taken on the 25th Anniversary in 1889, but in that year the Lodge lost a very earnest and enthusiastic member, Brother Frederic Winsor, M.D., who passed away in Bermuda, and was buried there with unusual honors. He was widely known and respected in Winchester, and very active in Town affairs. In the Civil War he was Surgeon of the 49th Massachusetts Regiment, and after the War, gave his Army Officer's sword to our Lodge, and it was used for years by the Tyler. His son Robert later presented a finely engraved sword to take its place, and was gratefully given his father's sword in return. The second Winsor sword is the one presently in use by our Tyler. The next twenty-five years from 1889 to 1914 showed continuous and healthy progress. Membership almost tripled from 99 to 295. On May 26, 1914 an elaborate Banquet and Fiftieth Anniversary Celebration was held in the Town Hall. Most of the space in the "Winchester Star", our local newspaper, that week was given over to a detailed account of that event, and pictures of the Masonic notables who attended. The late Wor. Ernest W. Hatch was Master, and was assisted by Brother J. Churchill Hindes, presently a Life Member of this Lodge, as Master of Ceremonies. His Excellency, Governor and Brother Samuel W. McCall, was on the Committee of Arrangements. 1920 saw the founding of Mystic Valley Lodge, whose first presiding Master was R. W. William M. Belcher, Master of William Parkman Lodge in 1897-98. Then the Chapter was organized, and the Eastern Star, Rainbow Girls and DeMolay rounded out our Masonic group at 1 Mt. Vernon Street. In 1925 Wor. William Walbridge gave us the beautiful glass bell which you see here tonight, modelled in the shape of the Liberty Bell at Philadelphia, and used in our Master Mason Degree at the hour of twelve. In 1937-38, looking forward to the 75th Anniversary and the opportunity to expand and modernize with a change of building ownership, we moved our Banquet Hall and kitchen to the second floor. The former dining area became our present Lounge. On May 16, 1939, the late Wor. W. Allan Wilde as Master and Wor. Kingman P. Cass as Anniversary Chairman greeted Most Worshipful Joseph Earl Perry and Guests at a Banquet and Dance in Metcalf Hall of the Unitarian Church, once again a milestone in the progress of the Lodge. So here we are, at our 100th Birthday Celebration. All honor to Most Worshipful William Parkman, who for twenty years continued his lively interest and encouragement in all our activities. In closing I would like to read a few verses from a special poem he wrote on the occasion of installing our Officers January 9, 1883, as recorded by Secretary William F. Fitch. Last but not least came Knapp. If Charter they could get. Who loves his Brother P.
Said William, I will see. And no man made denial. And none of them forget. Here indeed was the heartfelt expression of friendship from our energetic sponsor, that wonderful Masonic gentleman, MOST WORSHIPFUL WILLIAM PARKMAN. WILLIAM PARKMAN LODGE. This is a new Lodge, located in the pleasant village of Winchester, in Middlesex County. It having worked the past year under Dispensation, a Charter was granted to it by the Grand Lodge on the 14th of June, and on the evening of the 22d it was duly Constituted, its Hall Dedicted, and its officers Installed by the M. W. Grand Master, assisted by a full delegation of the officers of the Grand Lodge. The Constitution and Consecration were in private. At the Dedication and Installation of officers the ladies were admitted, wh were present in large numbers. For their better accommodation the latter ceremony took place in the Lyceum Hall, which was beautifully and emblematically decorated with flags and other devices. In the East was a rich Canopy, bearing on the face of the arch, in gilt letters, the words WILLIAM PARKMAN LODGE, and on its base, the word WELCOME. In the West was also a Canopy bearing the words Faith, Hope, Charity, and the other portions of the Hall were decorated to correspond, The whole design was in good taste and well carried out. The artist was Mr. Beal of this city. The Masonic Hall is one of the prettiest in the State, - neat in all respects, and admirably adapted and furnished for the purposes for which it is to be used. The ante-rooms are small but convenient, and fitted up in the same good taste that characterizes the main room. At the conclusion of the Masonic ceremonies the large Hall was given up to the ladies, and soon converted into a Fairy scene, with tables spread with the luxuries of the season, and decorated with the choicest flowers. The magic hand of beauty was visible everywhere, and bright eyes and joyous faces ruled the hour. It was an occasion to be treasured up among the pleasant memories of the past. As a finale, short speeches were made by the Grand Master and some other Brethren; at the conclusion of which the company dispersed, all apparently gratified and happy. The Lodge has done a good business the past year, and starts off on its new career under the most encouraging prospects. It is in most excellent and reliable hands, and its future can hardly fail of eminent and enduring success. Albion K. P. Joy, W.M. Albert G. Lane, S. S.
The brethren of William Parkman Lodge are zealous in all matters which tend to promote the interests of Freemasonry and their own comfort. We had the pleasure of seeing on the evening of January 13th, how they conduct business which concerns the Lodge. It has been contemplated to occupy newer and better apartments in a handsome brick building, recently erected near the old one; but, as a matter of prudence, it Was thought wise to see where the means could be had to pay the expense of fitting and furnishing. A committee was charged with this, and, within a week, more than enough was pledged at call. The Lodge was chartered in 1866, and now has seventy-eight members, and has held in all one hundred and sixty-three meetings. The records show that it has been fraternal and charitable; one entry showing that quite recently it had given $49 for the benefit of a widow. The occasion of our visit was the installation of the officers by Past Grand Master Parkman, who has performed the same service annually, to the pleasure of the Lodge, since it was organized. W. Bro. T. S. Spurr, retiring, was the recipient of an elegant Past Master's jewel, presented by the installing officer in behalf of the Lodge. At the close of the ceremonies a collation was served, and a social hour was passed pleasantly. The following is a list of the officers installed: N. F. Marble, W. M.; George S. Littlefield, S. W.; John D. Twombly, J. W.; George F. Parker, Treasurer; L. S. Quimby, Secretary; George Cook, Chaplain; J. H. Dwinell, S. D.; E. H. Stone, J. D.; Ed. Robinson, S. S.; F. A. Patch, J. S.; C. H. Dunham, Marshal; C. L. Harrington, Organist; W. F. Foster, I. S.; Reuben C. Hawes, Tyler. On Friday evening, Jan. 14, William Parkman Lodge threw open the doors of its beautiful new lodge-room and invited Masonic brethren and its lady friends to witness the ceremonies of dedication and installation. The company numbered two hundred persons. It is safe to say that no Lodge in the Commonwealth has a more admirably adapted suite of rooms than this which was dedicated on this occasion. The rooms occupy the entire upper story of the new brick block near the depot; the lodge-room proper being fully forty feet square. Commodious anterooms adjoin it, and a hall suitable for literary, dramatic or social entertainments is situated on the same floor, and this is so arranged that it can be used as a banquet hall for the Lodge, with closets and kitchen attached. The dedication ceremony was performed by M. W. Samuel C. Lawrence, Grand Master, assisted by R. W. Edwin Wright, Dep. Grand Master; R. W. William H. Chessman as Senior Grand Warden; R. W. Nathan G. Kimball, Junior Grand Warden ; R. W. William Parkman as Grand Treasurer; R. W. Tracy P. Cheever, Recording Grand Secretary; R. W. Wyzeman Marshall, Past Grand Warden; Rev. Bro. William R. Alger as Grand Chaplain; W. Frederick D. Ely, Grand Marshal; W. John L. Stevenson, Grand Sword Bearer: Bro. Charles W. Stevens as Grand Architect; W. Thomas S. Spurr and Joseph L. Whittaker as Grand Stewards; and W. Henry J. Parker, Grand Tyler. Among the invited guests were Gen. N. P. Banks, State Senator Thomas Winship, Wor. Alfred F. Chapman, and a few others whose names we failed to get. At the conclusion of the service Gen. Lawrence briefly addressed the members of the Lodge. Master George S. Littlefield, Senior Warden John D. Twombly, Junior Warden Herbert Dwinnell and the others, were then installed by Past Grand Master Parkman, whose felicitous manner of addressing the candidates put the assembly in the best of spirits. After finishing the service he spoke of his love for the Lodge, and complimented its members in the highest terms for their loyalty, as shown both in the erection of the hall, and in their generous contribution toward liquidating the debt on the Masonic Temple in Boston. The curtains were then drawn aside, and the social hall was seen to be arrayed as a dining-room. Preceded Dy the officers of the Grand Lodge, the company proceeded to the tables, and for an hour and more, participated in the pleasures of both bodily and mental refreshment Master Littlefield presided, with the Grand Master on his right, and after the cloth was removed, short and happily worded addresses were made by a number of the gentlemen whose names have been mentioned. The services of dedication and installation were materially aided by the Temple Quartette of Boston. A special train at M.30 bore the last of the visitors homeward. A very interesting Masonic ceremony took place at Masonic Hall, Winchester, on Tuesday evening January 9th, when R. W. William Parkman, P. G. M., installed the officers of the Lodge named after himself, as follows: John D. Twombly, W. M.; J. Herbert Uwinell, S. W.; Edwin Robinson, J. W.; George F. Parker, Treas. 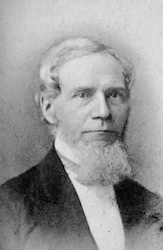 ; William F. Fitch, Sec. ; George Cooke, Chap. ; Charles H. Dunham, Marshal; Robert C. Metcalf, S. D.; Walter V, Smalley, J. D.; David N. Skillings, S. S.; Ephraim H. Stillings, J. S.; Warren F. Foster, I. S.; Joseph D. Sharon, Tyler; James C. Johnson, Organist. P. G. M. Parkman performed the ceremony in his usual genial and happy manner, and made some most excellent remarks, and read an original poem, which was heartily enjoyed by all present, and by a unanimous vote of the Lodge, it was ordered to be spread upon the records. R. W. Thos. S. Spurr, D. D. G. M., in behalf of the members of the Lodge presented to the retiring W. M. George S. Littlefield, an elegant Past Master's Jewel, made by Warren L. Knox, a member of the Lodge. W. Brother Littlefield responded in a few well-chosen words. When the Lodge was called from labor to refreshment, the visiting brethren and members gathered around the well-burdened tables in the banquet hall, and alter refreshing themselves, listened to speeches by Messrs. Parkman, Spurr, Bailey and Elder, and then joined in singing a number of familiar songs. 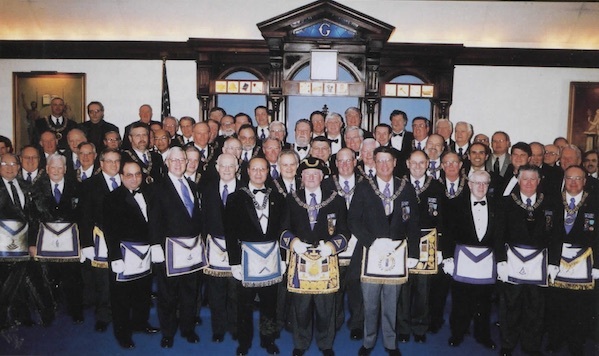 The celebration of the Twentieth Anniversary of this Lodge at Winchester, Mass., on Friday evening, May 9th, was attended with complete success, and must have been highly gratifying to the brethren composing it, as it certainly was to their guests. The prominent feature in the programme was a historical address, covering the entire period of twenty years. A quartette of male voices sang several selections during the evening, and single voices contributed in a similar way to the common pleasure. A fine banquet was served, at which something like two hundred ladies and brethren were seated. Past Grand Master William Parkman, for whom the Lodge is named, was heartily encored, and spoke feelingly in regard to the occasion. R. W. Brother Ely, Deputy Grand Master, spoke in response for the Grand Lodge, Brother Thomas S. Spurr responded gallantly for the ladies, but the speechmaking was necessarily limited by the lateness of hour and the departure for the cars homeward by non-residents of the town. The Annual Visitation to this Lodge was made on the evening of October 11th, by R. W. Charles H. Crane, D. D. G. Master for the Sixth Masonic District, and attended by his suite. The good reputation of the Lodge is so well established and maintained that the words of praise spoken in its behalf were not empty ones. The pleasant and beautiful apartment occupied by the Lodge contribute to make a visit to it enjoyable and this fact is appreciated by members as well as by visiting brethren. 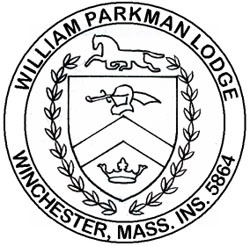 William Parkman of Winchester, Mass., has attained the dignity of a half century career and the notable event was duly celebrated Tuesday, May 26, by a reception and banquet in the Town Hall, which was attended by a large number of brethren. The lodge met at 5.15 o'clock in its apartments, where the officers of the Grand Lodge were formally received, being introduced by a committee, of which Rt. Wor. 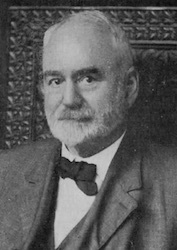 William M. Belcher was chairman. Following these exercises the brethren formed and marched in a body to the Tewn Hall, where the banquet was served. Light tables were spread the length of the large hall, the head table at right angles across the front at the stage. Cut flowers and boutonniere decorated each table. The postprandial exercises were opened by Wor. 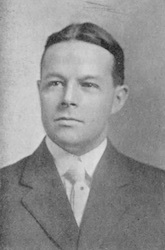 Master Ernest W. Hatch, who introduced the toast-master, Rt. Wor. Solon W. Stevens, who proposed the following toasts: "Our Flag, our Country, our President, and the Most Worshipful Grand Lodge of Massachusetts," "The Honored Dead of William Parkman Lodge." Addresses were made by Past Grand Master Charles T. Gallagher, who related many reminiscences of William Parkman, who was at the head of the Grand Lodge when the lodge which bears his name was organized. Most Wor. Brother Gallagher was followed by Bro. 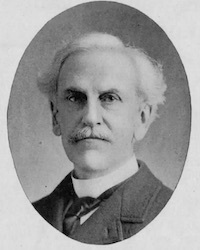 Samuel J. Elder, who kept his hearers in good humor with his fund of stories. Rt. Worshipful Emery B. Gibbs, D. G. M., brought congratulations on the completion of the first half century of the lodge's existence. Most Worshipful Melvin M. Johnson, Grand Master, spoke on "Masonry and the Civic Life of Today." "In the old days," he said, "Masonry was an operative service; today it is a speculative service. Operative Masonry built the Gothic temples throughout Europe and left its imprint on the architecture of the world. Speculative Masonry has developed into a great moral force in the world. "Fifty years ago, when this lodge was founded, the country was in the middle of a great fratricidal strife. If we are to avert another great strife in our land we must be guided by the immutable principles on which Masonry was founded, which alone will save the land from anarchy. "We must trust not to force and power, but to love for God and man. We must teach the world the lessons learned in the lodge room." George S. Littlefield, secretary of the lodge, read the historical address. The first meeting of those who desired to form a lodge was held in January, 1864, and another February 15, while March 4 it was decided to apply for a dispensation, which was granted under date of May 9. The organization took place May 10; Albion K. P. Joy was the first Master, Josiah F. Stone Senior Warden, and Abijah Thompson third, Junior Warden. June 16, 1865, a charter was granted, and June 22, 1865, the lodge was duly constituted. At the same time the apartments in Lyceum Hall were dedicated. The masters in order of seniority have been: Albion K. P. Joy, Josiah F. Stone, Edwin A. Wadleigh, Charle; H. Moseley, Alfred W. Quimby, Charles E. Follansbee, George W. Spurr, Thomas S. Spurr, N. Frank Marble, George S. Littlefield, John D. Twombly, J. Herbert Dwinell, Walter V. Smalley, John D. Twombly, William S. Walbridge, Charles E. Corey, John H. Winchenbach, Charles A. Lane, Rt. Wor. William M. Belcher, Frederick E. Belcher, Edwin A. Symmes, Benjamin T. Morgan, Edgar W. Metcalf, Fred M. Symmes, Frank F. Carpenter, George F. Edgett, Perc W. Witherell and Ernest W. Hatch. In its 50 years of existence 548 men have been associated with the lodge. Of this number 380 received the degree in it and 168 affiliated from ther lodges. The present membership is 296. The music was furnished by the Weber Male Quartet of Boston. Among the brethren who were expected to speak was Wor. Bro. Levi G. Gould of Wyoming Lodge, Melrose, who was present at the constitution of William Parkman Lodge, but who was obliged to retire without speaking, on account of the lateness of the hour. The committee which had charge of the anniversary exercises consisted of Worshipful Master Ernest W. Hatch, Past Grand Warden William M. Belcher, Past Masters George S. Littlefield, Benjamin T. Morgan, George F. Edgett and Percy W. Witherell, Senior Warden Wilbur S. Locke, Junior Warden Jay B. Benton and George A. Barron. That a committee of fifty (five captains) be appointed to raise $60,000 in contributions on or before January 1, 1920. That the Lodge choose by ballot, one at a time, by a two-thirds vote, seven members to serve as Trustees, to perfect arrangements and to continue as Trustees of the property. That the Trustees so chosen shall prepare, sign and record a declaration of trust, which shall be approved by vote of the Lodge. They shall be designated Trustees of William Parkman Masonic Temple. That the Trustees shall hold office, during life, but any Trustee may resign or may be removed by a two-thirds vote of the Lodge, after due notice. That vacancies in the Board of Trustees be filled by ballot of the Lodge — a two-thirds vote required; notification of election to be given. Till vacancy is filled rest of Board may act. That as soon as necessary funds are raised for that purpose lot be acquired after the approval of site by the Lodge, after notice. That Masonic Temple be built by Trustees after funds for that purpose are raised. That Trustees have power of sale and mortgage, after vote of the Lodge duly notified. That Temple when erected be held for use of William Parkman Lodge for all necessary purposes of the Lodge, either under lease or agreement; the Lodge to pay such sum as rental as may be agreed upon as necessary. That other Masonic bodies, The Eastern Star and any Masonic Club of members of William Parkman Lodge, be the only users of the Temple, outside the Lodge, on terms satisfactory to the Trustees. That any balance of funds held under this trust, not required for depreciation or maintenance, shall be turned into the Charity Fund of William Parkman Lodge. That Articles of Association contain provision that the organization is for Masonic and charitable purposes only. That modifications of declaration may be made after a two-thirds vote of Lodge, duly notified. That Trustees choose a Chairman and Treasurer, and these be authorized to sign legal documents. That the Certificate of the Secretary of William Parkman Lodge, under seal of Lodge, be conclusive evidence of concurrent action of the Lodge required on any point. That Trustees hold the title of real and personal property subject as aforesaid. That Trustees may appoint such Agents and employees as they deem advisable. That Trustees choose a Secretary who shall be the proper officer to certify all actions of the Trustees. His sworn certificate to be conclusive. That the Trustees shall report annually to the Lodge in print. Grand Master Donald Gardner Hicks, Jr. (front row center) was in attendance at the March event. To the left of the Grand Master is Wor. Kamel Oussayef, presiding Master of Parkman Lodge; to the right is R. W. Gleason. The curator for this page is Brother Frank J. Kautz II. Please direct informational updates and questions to him. This page was last modified on 27 December 2018, at 10:26. This page has been accessed 18,574 times.